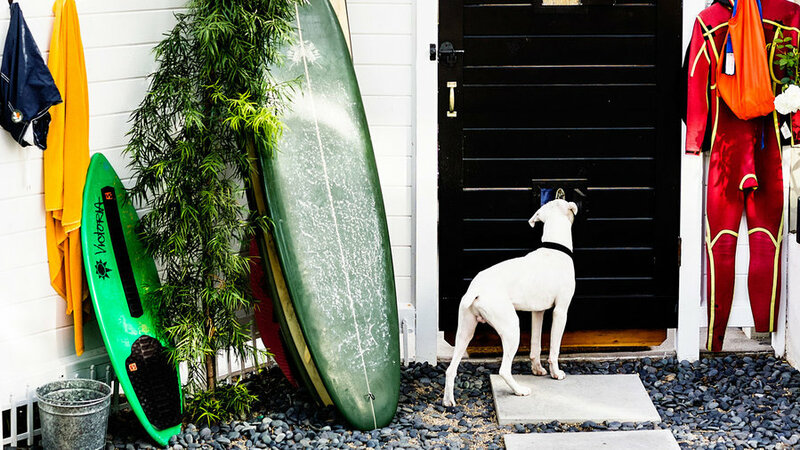 When Dana Marron and her family moved into their 1,600-square-foot home in Laguna Beach, California, she knew she would need to make every design choice count. 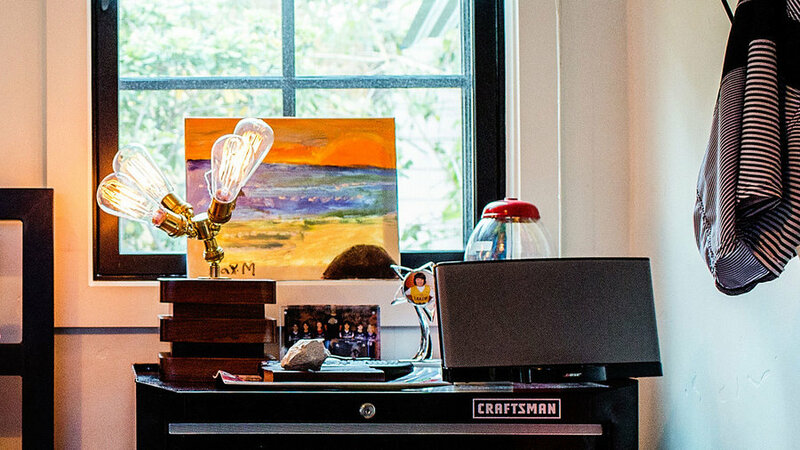 “Because the house was historic, we were limited in what we could change, so we had to be very creative,” says Marron, who shares the space with her husband, Armando, and son, Max. So Marron, co-owner of local clothing shop Laguna Supply, relied on a few daring elements to deliver big visual impact, while also creating the illusion of more space. Varying finishes give the kitchen and dining room character. “It’s like a math problem: You start with one thing and play off that,” Marron says. A dark green La Cornue stove contrasts with light, modern oak cabinets; shiny metal chairs offset the rustic chipped-paint dining table. “The irony of having white floors is that you worry less about them. Scratches don’t matter, because that’s the character you’re going for in the end,” adds Marron. Marais A Side Chair in Antique Copper (similar to shown), $145; industrywest.com. 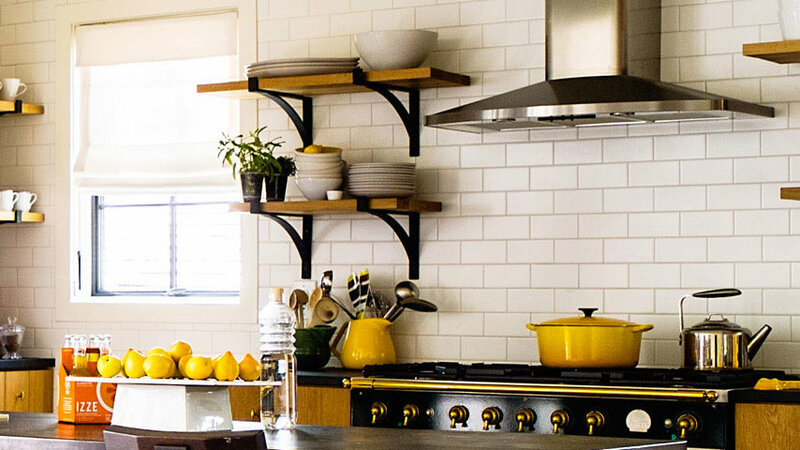 Swap standard steel shelf brackets for chic black. A self-described former modernist, Marron surprised herself by picking a tradi­tional chesterfield sofa. 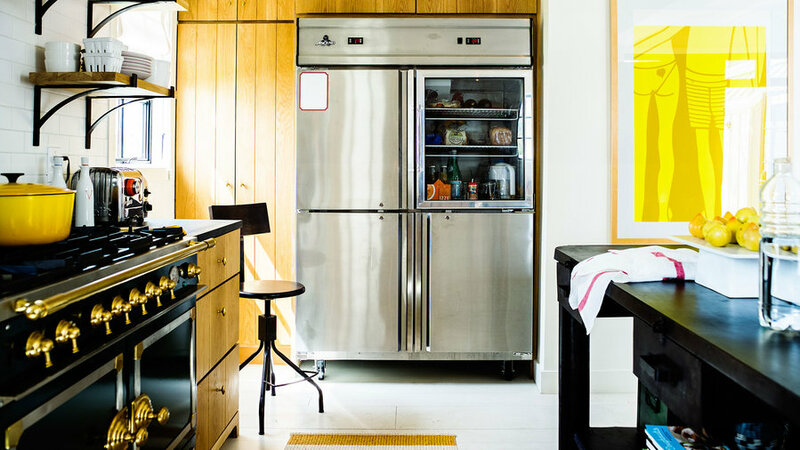 “When I bought it, I knew I was headed in an entirely new direction design-wise,” she says. 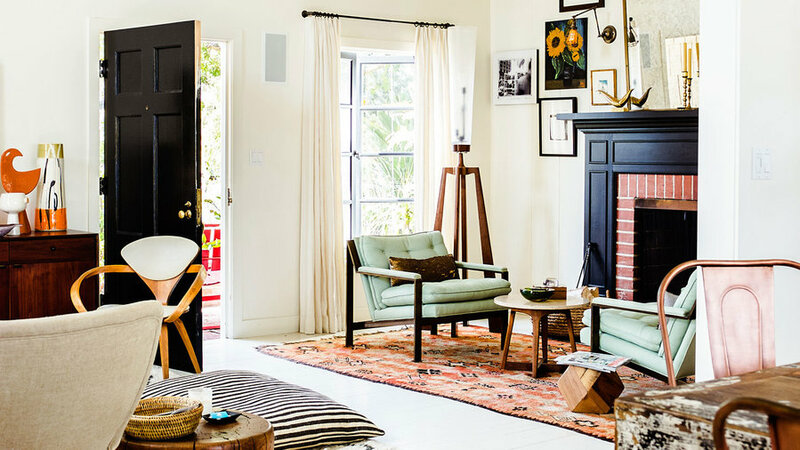 To avoid any potential stuffiness, she mixed in a midcentury modern chair and coffee table, ethnic rug, and colorful textiles. “I never want to be too thematic,” Marron says. “To me, there is more authenticity in bringing different worlds together.” Chesterfield Grand Sofa in Washed Linen/Cotton in Walnut (similar to shown), $2,499; potterybarn.com. 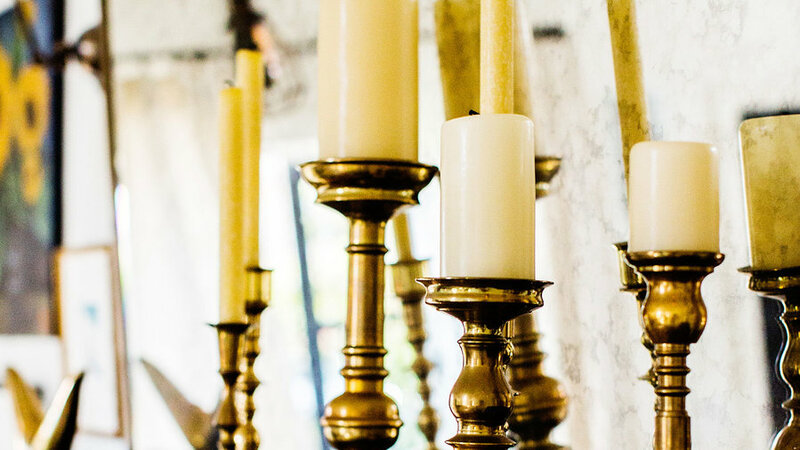 A variety of candlesticks look like a collection when they’re all brass. Group different styles of art together for an informal gallery. 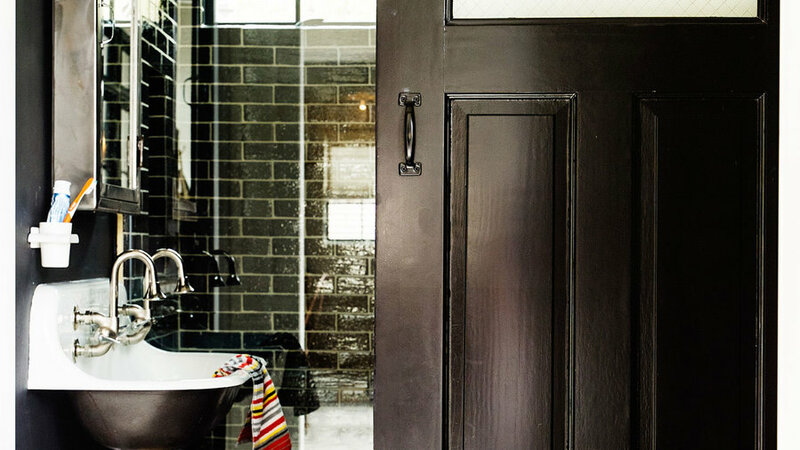 By daring to use all black, Marron gave a tiny hallway bathroom an identity. Floor-to-ceiling Waterworks tile, with its irregular shape and white grout, creates a vintage look. Against that backdrop, the white utility sink pops. Grove Brickworks 3 1⁄16- by 8 1⁄4-in. tile in Bar Blackening, $20/square ft.; waterworks.com. 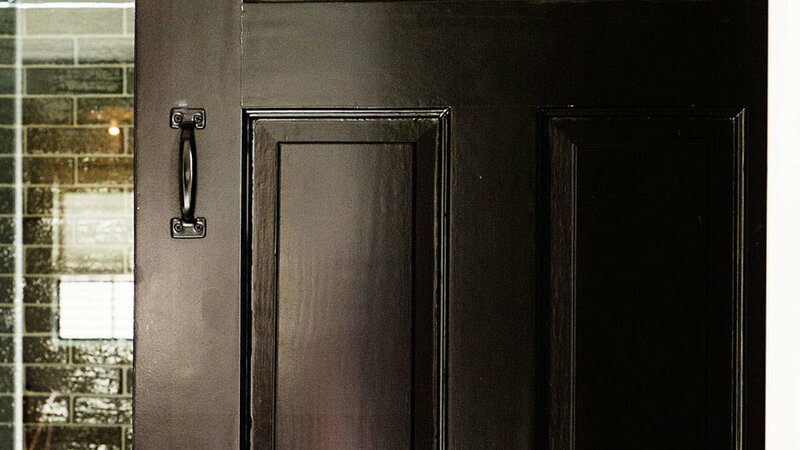 Paint interior doors black to make them look more architectural. 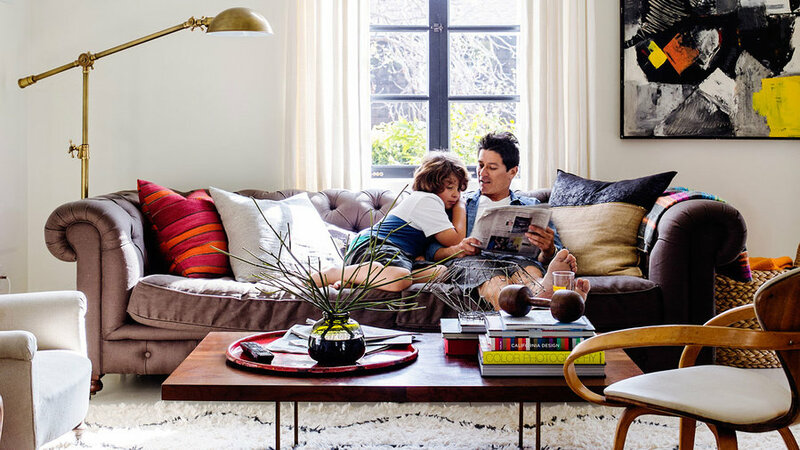 A house flows better (and seems roomier) when spaces share elements. 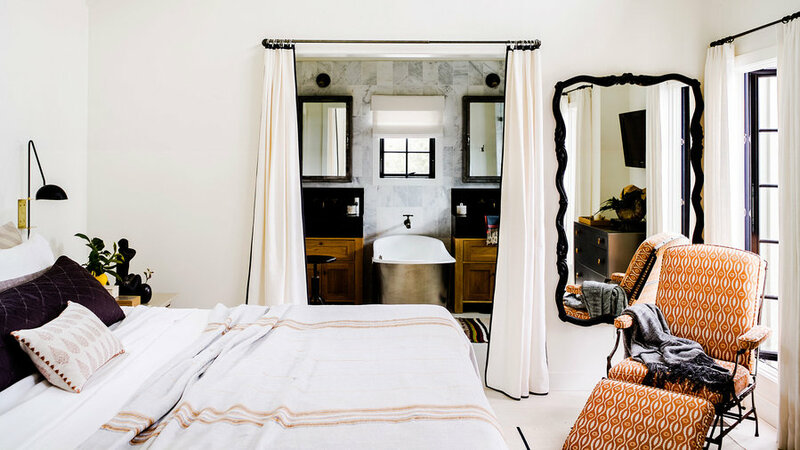 Marron repeated a black, white, and brass combo, which shows up here in an ebony-edged mirror, white curtains trimmed in black, and sconces with a hint of metal. In the adjoining bathroom, the vanities are made of the same oak as the kitchen cabinets. Rustic Linen Blanket in Pewter with Tangerine Mid-Gray, $428 for queen; coyuchi.com. Factory Light No. 6 Cable (similar to shown), $259; schoolhouseelectric.com. “We wanted our backyard to be mostly hardscape, so it could function like an extension of the house,” says Marron. Instead of an outdoor dining set, she chose mismatched chairs and a low table from Target. 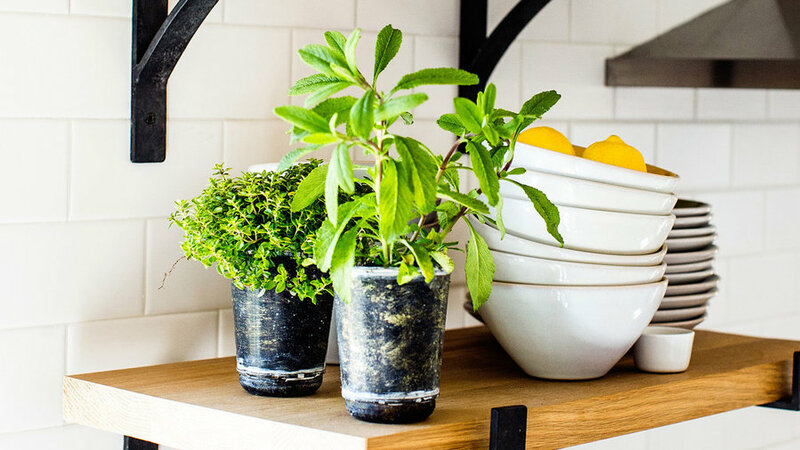 The container garden—planted in metal buckets and barrels—is a low-maintenance way to add green to the patio. The metal and glass doors were ​Marron’s biggest splurge; she had them installed to ease the flow between the house and yard. “When we entertain, it’s very ‘make yourself at home.’ Those steps down to the patio? I use those as seating,” adds Marron. 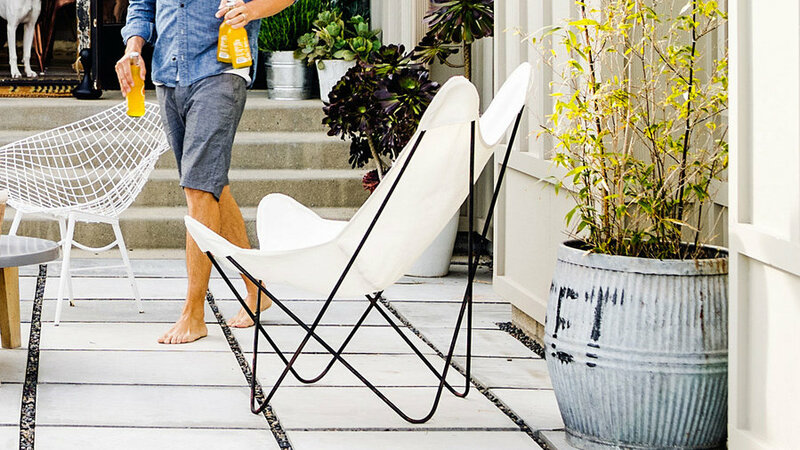 Mismatched chairs in white make a casual “set.” Butterfly Chair with black frame and white canvas cover, $500/set of two; circa50.com. 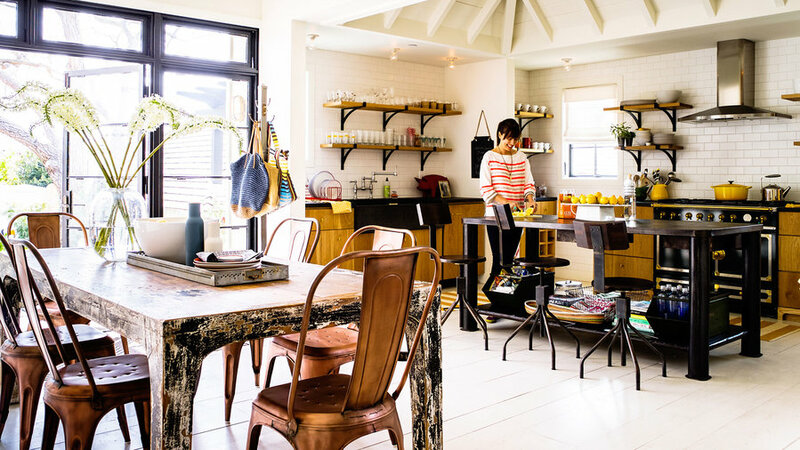 Marron shops for for modern cookware and pottery at a local homewares store, Vertigo Home. 1550 S. Coast Hwy., Laguna Beach; vertigohome.us. Fun vintage finds always spice up a room. 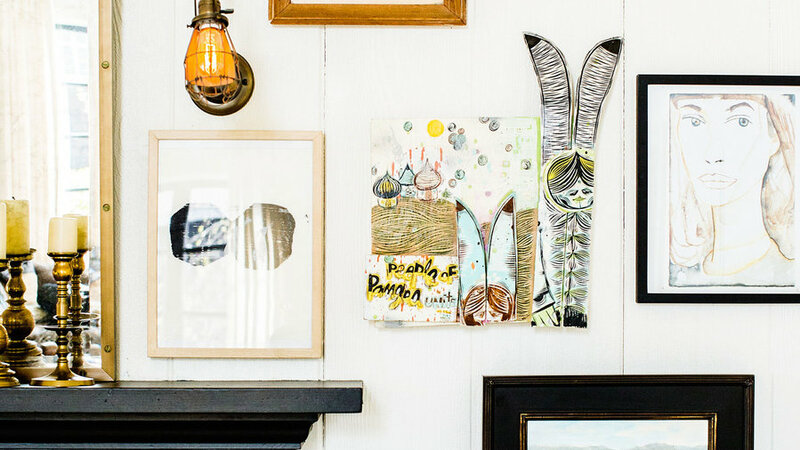 For a wide range of vintage goods, Marron goes to local shop Archive. 3305 Laguna Canyon Rd., Laguna Beach; archive.1stdibs.com. Carefully chosen art and upholstered pieces add personality. Marron shops at local treasure trove Juxtaposition Home. 7976 E. Coast Hwy., Newport Coast; juxtapositionhome.com.